All fans of Christina Aguilera are eagerly awaiting for the release of her new album. And it seems that they no longer have to wait. A photo has started circulating through social networks in which her new album’s name and the title of every song appears, you can even see what she collaborated with other artists. 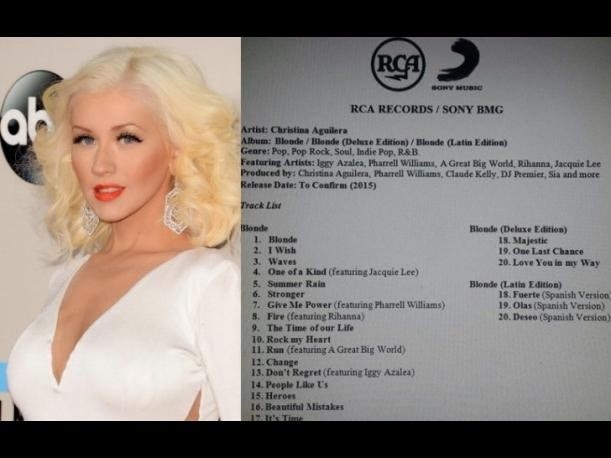 The document indicates that the Aguilera’s sixth studio album might call 'Blonde' and will contain 20 songs in its deluxe edition, among which would duets with Rihanna, Pharrell Williams, Iggy Azalea and A Great Big World group. Is it possible? So far, the blonde has not spoken about it, because she is on vacation at Disney. Would such document be true? Can only hope that representatives of the artist confirm or deny this information.